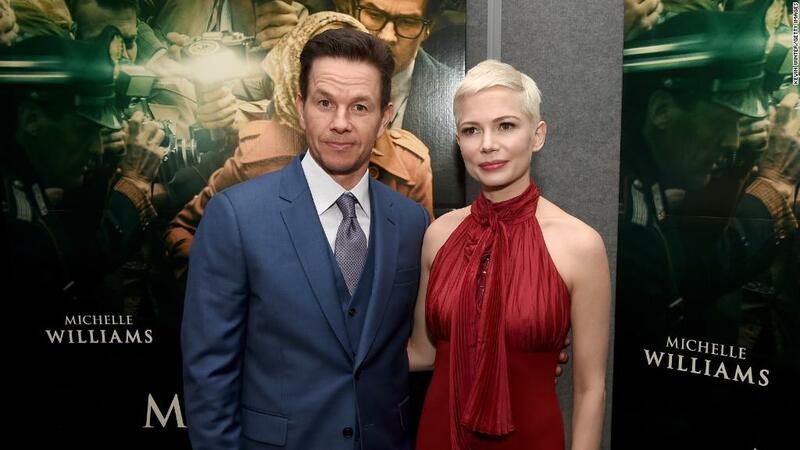 Hollywood was abuzz Wednesday with chatter about a report that said actress Michelle Williams received less than 1% of Mark Wahlberg's paycheck for reshoots of their film, "All the Money in the World." USA Today reported Tuesday that Wahlberg was paid $1.5 million to reshoot his scenes, while Williams received a per diem of $80 per day, totaling less than $1,000. CNNMoney has reached out to for Wahlberg and Williams' representatives for comment. It's not clear if Williams is aware that her co-star was paid more for reshooting the scenes, but she told USA Today in December that she was willing to do what needed to be done for the reshoot. Scott told the newspaper then, "Everyone did it for nothing." CNNMoney has also reached out to Scott for comment. "I said I'd be wherever they needed me, whenever they needed me," she told USA Today at the time. "And they could have my salary, they could have my holiday, whatever they wanted. Because I appreciated so much that they were making this massive effort." Actress Jessica Chastain tweeted her support of Williams, asking fans to "Please go see Michelle's performance in All The Money in The World." "She's a brilliant Oscar nominated Golden Globe winning actress," Chastain tweeted on Tuesday. "She has been in the industry for 20 yrs. She deserves more than 1% of her male costar's salary." Other actresses including Mia Farrow, Amber Tamblyn and Sophia Bush also spoke out on social media against the reported pay disparity. Williams and Wahlberg are represented by the same talent agency, William Morris Endeavor, a detail that Bush was quick to point on in her tweet. Exposing the gross disparity in pay & hard evidence of the gender gap— negotiated by the SAME agents no less! — isn't a witch hunt. It's a demand for fair practices. One person suggesting he step up for a costar, or women in general, is just a suggestion. Not a Putin-level order. "Exposing the gross disparity in pay & hard evidence of the gender gap— negotiated by the SAME agents no less! — isn't a witch hunt," Bush tweeted. "It's a demand for fair practices." 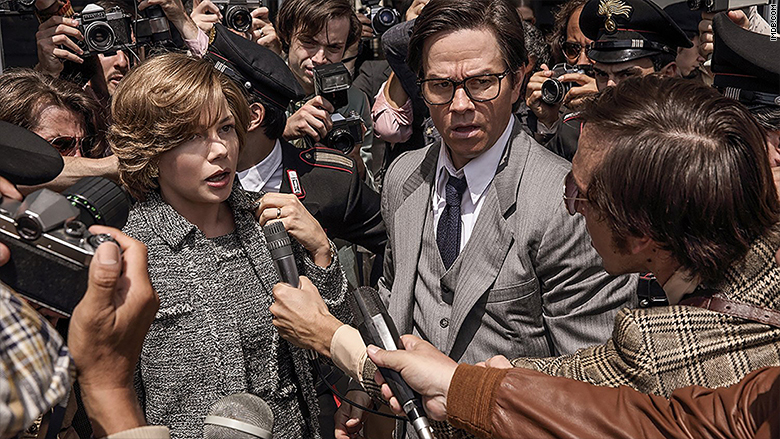 "All the Money in the World" was produced by Imperative Entertainment and distributed by Sony's TriStar Pictures. A source close to production says Sony was not involved in talent pay negotiations. CNNMoney has reached out to Imperative Entertainment for comment. Wahlberg is known in Hollywood as a shrewd negotiator. The Washington Post reported in November the pay disparity for the reshoot and noted that "Wahlberg, along with manager Stephen Levinson and agency WME, have a reputation in Hollywood for driving a tough bargain." The Post, citing sources close to the negotiations, reported then that Wahlberg was paid at least $2 million for approximately 10 days of work. Wahlberg was named Hollywood's highest paid actor by Forbes last year, raking in an estimated $68 million in the publication's 12-month scoring period. Director Ridley Scott decided to reshoot scenes from "All the Money in the World" that included Kevin Spacey after the Oscar-winning actor was accused of sexual harassment and assault. The scandal started with Anthony Rapp, who told BuzzFeed that Spacey made a sexual advance toward the then 14-year-old Rapp. He has also been accused of serial harassment throughout his career. Spacey issued a statement saying he did not remember the alleged incident, but apologized for what he said would have been "inappropriate drunken behavior." Actor Christopher Plummer replaced Spacey in the role of billionaire Jean Paul Getty in the film based on the real-life kidnapping of Getty's grandson John Paul Getty III.